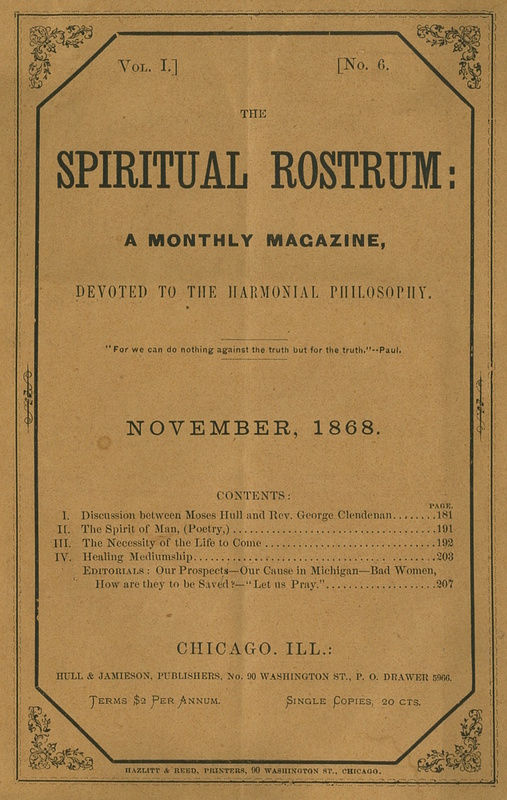 A Monthly Magazine, Devoted to the Harmonial Philosophy. 1/1, June 1868-1869. $2.00 a year, 36-48 pp. Hull (1835-1907) and Jamieson had long histories in spiritualism, free thought, and free love. The journal was, at least initially, a success, paying its own way, the editors claimed, by its sixth issue, but it is difficult to understand why it did if it did. It featured literary debates (by exchange of letters) between Hull or Jamieson and some orthodox clergyman on the fine points of the Bible on the question of spiritualism, and appropriate sermons on subjects like "The Necessity of the Life to Come." These were interspersed with short articles on topics like healing medumship, "Bad Women--How Are They to be Saved?" and "How Women Can Earn a Living." The journal emphasized that it was to be "independent," which seems to have been a reference to the Religio-Philosophical Journal, a competitor, which had declared that it would publish even well-authenticated communications from spirits "only if they met that journal's "idea of propriety." This, which was clearly a veiled reference to the brewing debate over "free love" that both Hull were involved in and offended their ideas on individual sovereignty and free speech. In 1869, as reported in the Banner of Light for February 27th, Hull advocated--the first to do so but not the last--the establishment of a "Speakers' Protective Union." "The time has come," the Banner proclaimed, "when our toilers in the field should be better sustained; and we know of no better method of accomplishing this desirable end than to do as Br. Hull suggests, namely, to form a Speakers' Protective Union, to protect them against destitution." The proposal was continually raised but never adopted widely. F.W. Evans, Spiritualism on Trial (Cincinnati, 1875), 38, notes Hull's admission in the journal that "a very great portion of the spirit manifestations are unworthy of confidence." Contributions by D.W. Hull, J.H. Powell, Lita Barney Sales, J.O. Barrett, J.H.W. Toohey, Mrs. H.F.M. Brown, H.T. Child, H.B. Storer,Lucy L. Stout (who may have been the wife of F.B. Dowd), and others. The journal was still being published in August 1869 when Jamieson bought out the then owner, Joseph C. Gill, and Hull resigned as editor, though he remained connected with the journal. WHi; University of Michigan; Amherst College.